It doesn't have a lot of options yet but I hope you guys will enjoy it! Things I'm looking to implement in the future are some randomization options for monsters (monsters bring a lot of trouble with the randomizer for several reasons) and random jobs for enemies. Enemies, or at least select enemy units, would probably have to keep their looks (so you would fight an archer that looks like a soldier or whatever) because of special animations for cutscenes, there's also the whole deal of equipment and learnt abilities so, yeah, not an easy thing by any means, don't expect it soon. I know random enemies is probably going to be the most requested feature but please understand that it's a very complex thing to make. The download includes a base patch (you HAVE to use the patch OR have a ROM that has the updated job and race customization hack). There's also a readme, and the randomizer itself has a lot of tooltips so I hope people won't be confused. Please leave any suggestions/comments you have on this thread. I am not quite sure what the differences are between shuffling and randomizing abilities. Is it that randomized abilities cannot land in their original job? Also when I tried it with the full JP skill purchase set installed it said that the rom was too big. Could we get it to append the seed to the end of the file name if the return seed option is checked? I am not quite sure what the differences are between shuffling and randomizing abilities. When you shuffle abilities the number of each specific ability remains the same, there will be 2 "Steal: Ability", no less, no more, since this ability exists exactly twice (one for hume thief, one for moogle thief). When you randomize abilities that's not the case, you could potentially end up with all jobs being able to learn "Steal: Ability". Is it that randomized abilities cannot land in their original job? There are no checks for abilities landing back into their original spot, or even the same ability being present on the same job multiple times. it said that the rom was too big. Maybe you set the freespace definition too far into freespace, which changed the size of the ROM, there's enough freespace to fit all of the hacks I made without increasing the size of the ROM. Either way the randomizer will be able to handle 32MB ROMs on the next update. Edit: Updated the randomizer with support for bigger files and Diedrik's seed on file name idea. I also updated the base patch because I forgot to remove the restriction of blue mage's not being able to purchase abilities, which really screws them with randomized abilities. There are some bugs on the current build of the base patch which I'm currently working on so you'll probably have to update soon, but since you have your seed you should be able to rerandomize the ROM from the new base after the update, if you find any issues. Actually sounds pretty easy to make, although it will depend on how the game handles setting the bit for different types of action. It could be named Cunning, as a reference to DnD 5e's Cunning Action. Works great. The previous one made a rom that had some trouble running on one of my mobile emulators, but this one does not have that issue. Unrelated bug I found due to the randomizer, opening a guest's skill learning menu causes the game to softlock. I think you should put your explanation of shuffle versus randomize in the readme, the one you put here for me is more clear I think. Thanks for adding the filename thing, I know that will be much more convenient for me. The randomizer almost makes me wish there was a way to just have every recruit have a randomized set of skills just to themselves. The variety of the characters out of the gate is amazing. Is the stat growth and unarmed damage also randomized? Edit: I have an animist who's reaction ability is counter magic, and the beret says it will let him use it before he learns it, but it does not let him do that. I think this might be related to a bug I already fixed and will no longer exist in the next update but I'll doublecheck. The randomizer almost makes me wish there was a way to just have every recruit have a randomized set of skills just to themselves. Sadly there's just no way to do that with how the game works, although I could add an option to eliminate job changing or limit it in some way for each unit, which would have a similar effect, with a catch 'em all feel to it. Personally I think no job changing would be the one to make the most sense and the easiest one to implement, maybe units would still be able to get abilities from other jobs for a secondary action command, but never change into them? Would you guys like to see challange run options like that added in? Or maybe released as external engine hacks? It's not, random grwoths are an option I would like to add in the future but I think melee damage isn't really important enough to justify adding an option for it. I just double checked, and it arises with a non-randomized JP Skill Purchase rom as well. Would you guys like to see challenge run options like that added in? Or maybe released as external engine hacks? I would definitely like to see challenge run options like that added. I really like the catch 'em all vibe. Could make for an interesting external engine hack, but if I were to pick one it would definitely be an option in the randomizer. Would it be possible to randomize the character's race after they have been added to the party so that their job and what other jobs they can use as a secondary are separate? I think that would really enhance the catch-em all vibe, even if abilities are not randomized. The other thing I like about that is that characters would have a pseudo-unique appearance. random growths are an option I would like to add in the future but I think melee damage isn't really important enough to justify adding an option for it. I am a huge fan of unarmed being feasible in games, but unfortunately you could not really figure out who is good at it without just making everybody punch stuff. Also, does the unarmed damage grow when leveling with a high unarmed class? I feel like it should. I know I would like it if it was part of the stat randomization, but I agree that most other people would probably not notice or care. There would be no non-tedious way to tell if a class has recieved more physical or magical skills, and have their stats favor that is there? Would it be possible to randomize the character's race after they have been added to the party so that their job and what other jobs they can use as a secondary are separate? No, the abilities a unit has depends on their race, even if the job stayed the same if you changed the race the job would be altered, possibly resulting in garbage that makes no sense if the new race has less abilities than the old one, and resulting in abilities shared with other jobs of the new race in the best of cases, but no unique ones. I was actually thinking about something like this the other day, but I'm unsure about how this idea could be implemented: esentially my idea is to have generics be able to change jobs without changing aspect, so you could have your soldier look like a viera archer or an enemy judge or whatever else you wanted, kinda like skins in online games. Just an idea though. does the unarmed damage grow when leveling with a high unarmed class? No, there is no growth, unarmed damage is terrible and there is no way to fix this without engine hacks. For now there is really no reason for this option to exist as it would always either be broken for early game or just as bad as vanilla. Currently I don't even know how the game determines what is magic and what isn't, so not really?. Once I figure that out I will be able to determine how possible it would be. There's also the issues of abilities that do no damage, mages often have status abilities, but so do other jobs, I don't know how I would account for that. I'm loving this randomizer so much. It's been my dream to have one for this game since I got into randomizers, and all of these ideas look really promising. I had an idea since the animations seem to work properly with everyone (as far as I've seen at least), since you can now purchase abilities rather than being forced to learn through weapons, would it be possible to randomize which class can equip which type of weapon? Be interesting to see the combos on that. The unique appearances would be a cool idea. Perhaps at some we could even see custom sprites? @Leonarth: I know you're focused on FFTA, but do you foresee eventually getting around to FFTA2? The bazaar could really use a randomizer. I'm loving this randomizer so much. would it be possible to randomize which class can equip which type of weapon? That is planned, but I first need to make the encounter randomizer since otherwise enemies will end up with weapons they shouldn't have. As I explained earlier, this might take some time to happen. Keep in mind that the JP purchase system isn't mandatory for the randomizer, you could build a base patch that only includes the new animations and all the current features would work perfectly. Perhaps at some we could even see custom sprites? Any battle animation done with that will have all the animations needed, as long as the person making it makes all the poses needed. I know you're focused on FFTA, but do you foresee eventually getting around to FFTA2? Patch a vanilla ROM with the new patch. 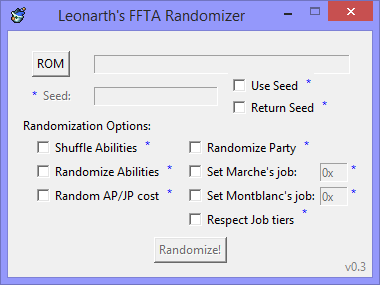 Randomize it with your old seed and the same options. That's it, replace your old ROM with this one. Make a backup if you are worried about it not workin/messing up! How is this idea for the collectable generics, disable job changing, and only allow them to use two classes, their starting class, and 1 randomly selected other class from their race. That would render them pretty unique I think. You might run into a handful of viera white mages, but their secondary class options are all likely to be different. I have not yet familiarized myself with your class unlock and lock out system though, so I am not sure how easy this would be to determine during run time. When you add the encounter randomizer, I would like a no equipment type limit option, I am currently playing with a patch that divorces equipment from class, so it would be pretty cool to see illusionists spawn with great bows, etcetera. Sad that you do not expect to ever get into FFTA2, your improvements to FFTA have uplifted the series immensely for me. only allow them to use two classes, their starting class, and 1 randomly selected other class from their race. This is something I want to do but I think the second part would be an external engine hack. I have to look more into how the recruited units are handled anyway, I don't know much about those. Sure, that shouldn't be a problem. Sorry, I'm a GBA guy. If we can make recruited units start with abilities (Which they probably should have in vanilla since they start in advanced classes), what you could do is just remove the job unlock requirements so no jobs can be unlocked, and give them 1 random ability. Thereby giving them access to learn from the job it comes from. This would also automatically create tiered values for the characters, a bottom tier character would be one that start with an ability that is in their starting job, thus not having a second job to pull from, a mid tier character would have their starting job, and access to one more, and higher tier characters would start with an ability that is in multiple jobs thus giving them access to 3 or more jobs. In that case any interest in messing with Tactics Ogre: Knight of Lodis for GBA at some point? what you could do is just remove the job unlock requirements so no jobs can be unlocked, and give them 1 random ability. I just started playing it for the first time the other day, not liking it too much so far, game feels really clunky and dated, and that music isn't great either, so I don't know. I've come across an issue, not sure if it's the base patch or something else but when I fight in the first mission, when a monster goes to attack my unit, it stops and just stands there, putting the game into a soft-lock. Not sure what's causing it, maybe an animation issue? I've tested it on 3 different randoms and even tried applying the patch to a clean file again. Wasn't happening in the previous version. Sorry about that, I forgot to make one change, I updated the base again, it should be fixed now. Testing the version before the one that required that hotfix, I have found that a moogle animist on height 7 attacking a target on height 9 with a silver sword has the no animation ergo disappearing problem. I will update now, and retry in case you already fixed that issue. Edit: After updating it did not do the disappearing thing, it used the new default animation case of standing. So good error catch, funny that it specifically says it will not do that in this instance on the change log. But yeah, apparently attacking with a height difference is an unplanned case. Additionally, the game no longer softlocks when pulling up the learning menu on guest characters, the learning menu is empty, but can be backed out of. Edit again: I have a black mage with ignore height who fails to spawn any blue movement tiles when he attempts to move, rendering him immobile.